By John C. Toman. Posted September 8, 2012, 10:28 AM. The weather is primed to deliver a warm, wet reminder that summer is still here and kicking this weekend. 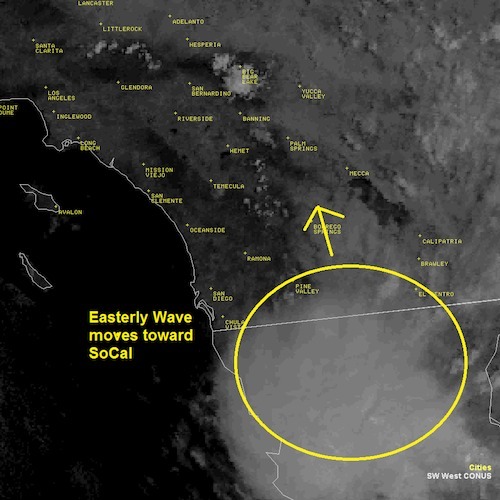 As of Saturday morning, moisture and instability were massing over the desert, and an upper low pressure area just inside Mexico was helping push it our way. 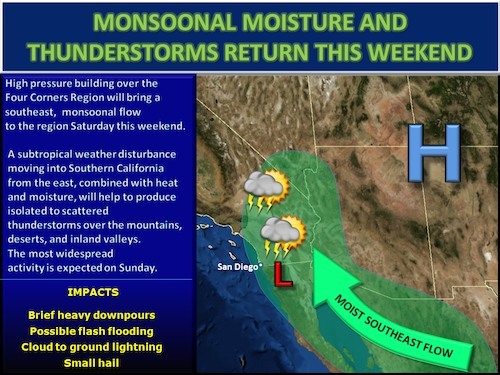 The impressive amount of subtropical moisture, combined with northeasterly winds in the upper atmosphere, should be enough to push showers and thunderstorms into some of the inland valleys by Saturday evening, increasing overnight, and then across Southern California on Sunday. Scattered light showers are expected across the region Sunday morning through Monday morning, with isolated thunderstorms and heavy showers possible. The best chances of rainfall will be Sunday morning in the south (San Diego County), and Sunday afternoon and evening in the north (Riverside and San Bernardino counties). It's also possible that showers or thunderstorms might reach as far west as WeatherCurrents' Simi Valley station. Other weather possibilities include heavy downpours, flash flooding, small hail, and lightning. Rainfall predictions range from about a tenth of an inch in San Diego, Temecula, Murrieta, Wildomar, Lake Elsinore, Riverside and San Bernardino, a little more in Menifee, Perris, and Moreno Valley, and to up to a half of an inch in more prone areas like Hemet and Beaumont. The last showery episode occurred Wednesday and left 0.01" of rainfall in a couple of inland valley spots, including Wildomar and Beaumont (Cherry Valley). September 8th-9th weather pattern. Courtesy of National Weather Service. Incoming moisture via satellite, 1:30pm Saturday.